Students, don’t miss out on a free Dinner with Bauman! Contrary to popular belief, there IS such a thing as a FREE dinner! 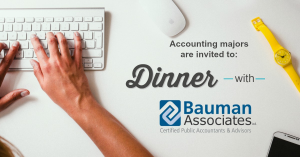 Join accounting professionals from Bauman Associates on Thursday, May 2nd for pizza, door prizes and a unique opportunity to find out what it is like to work in a public accounting firm. Students will also learn about the employment opportunities Bauman Associates offers and network with leaders in the field. This event will take place at UW-Eau Claire in Davies Center, Dulany Inn (Room 122) from 4:00 – 6:30 pm. Space is limited and applications are due May 1st, so submit yours today. We look forward to seeing you there!